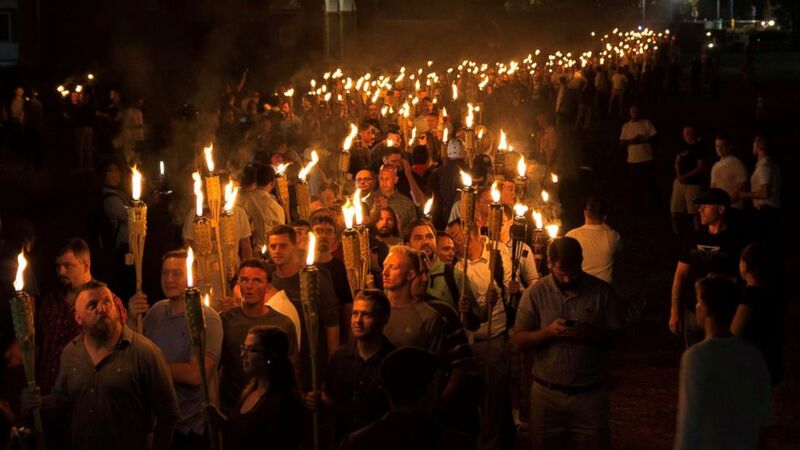 Hate and white supremacist propaganda have been at a high level in the year since the streets of Charlottesville erupted in deadly violence, according to the Anti-Defamation League. On Thursday, the ADL unveiled a first-of-its-kind interactive map documenting extremist and hate incidents in the United States. The map includes anti-Semitic incidents, white supremacist rallies, extremist shootouts with police, extremist-related murders and extremist plots and attacks. The ADL documented more than 3,000 incidents of extremism or anti-Semitism in the U.S. in 2017 and 2018. Most of the activity was concentrated in the eastern part of the country. George Selim is the ADL's senior vice president and a former Department of Homeland Security official who led outreach programs to Muslim-American communities to try to prevent radical extremism. Selim told ABC News that the Unite the Right rally in Charlottesville last year was "very significant because it's the first time that white supremacy really, since the civil rights movement, entered the public square." On Aug. 11, 2017, white supremacists descended on Charlottesville for the next day's Unite the Right rally, the stated purpose of which was to protest the planned removal of a statue of Confederate Gen. Robert E. Lee. The debate over what to do with Confederate monuments had been brewing across the country, but Charlottesville became a touchpoint. The weekend devolved into verbal and physical attacks between white supremacist groups and counter-protesters, turning deadly when a 20-year-old Ohio man allegedly accelerated his car into a crowd of counter-protesters, killing 32-year-old Heather Heyer and leaving 19 others injured, five critically. James Alex Fields, the alleged driver in the incident, was indicted earlier this summer on federal hate crimes charges. Fields has pleaded not guilty to those charges and has also been charged under Virginia law with murder and other crimes. Fields is currently in jail awaiting trial. In the months since Charlottesville, white supremacist propaganda has hit an even higher level, the ADL found. So far in 2018, the organization's Center on Extremism has tracked nearly 500 white supremacist propaganda incidents, more than in all of 2017. Since Aug. 12, 2017, the ADL has tracked 54 public events attended by white supremacists, including a recent demonstration on the Edmund Pettus Bridge in Selma, Alabama and a flash demonstration at the Parthenon in Nashville, Tennessee. The ADL also tracked an increase over the past year in white supremacist propaganda efforts, including anonymous visits to university campuses to put up flyers and the draping of banners from freeway overpasses. "White supremacy in this country is not going away," said Selim. "We've seen them evolve their tactics and techniques online. We've seen them effectively use social media to launch and spread their ideas." But the public outcry over Charlottesville also has resulted in some prominent white supremacists retreating from public view to the safer confines of the internet. "The best of America comes out in times like this," Selim said. "We see the values and virtues of tolerance and pluralism and inclusion on display in times where we see the most significant levels of hatred and bigotry and anti-Semitism."